Intense future climate change could have a far different impact on the world than current models predict, suggests a thought-provoking new study just out in the journal Science Advances. If atmospheric carbon dioxide concentrations were to double in the future, it finds, a major ocean current – one that helps regulate climate and weather patterns all over the world – could collapse. And that could paint a very different picture of the future than what we’ve assumed so far. Nevertheless, the authors of the new study point out, many climate models assume a fairly stable AMOC – and that could be affecting the predictions they make for how the ocean will change under future climate change. And because overturning circulation patterns have such a significant effect on climate and weather all over the world, this could have big implications for all kinds of other climate-related projections as well. 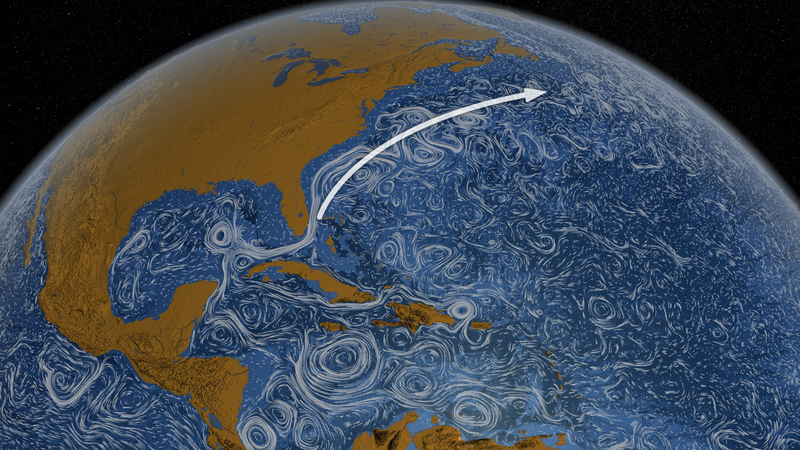 In a commentary published in RealClimate, Stefan Rahmstorf, an oceans physics expert at the Potsdam Institute for Climate Impact Research, explained how such a collapse could occur when the AMOC gets too weak. Because the AMOC is part of a larger global conveyor system, which ferries warm and cold currents between the equator and both poles, the model predicts disruptions in other parts of the world as well. Without cold water moving back down south again, the corrected model indicates a stronger warming pattern south of the equator than what’s predicted by the uncorrected model, causing a polarization in precipitation patterns over the Americas – more rain for places like northeastern Brazil and less rain for Central America. The model also predicts a greater reduction in sea ice for the Antarctic. All this doesn’t necessarily mean that everything we thought we knew about the future climate is wrong. For one thing, most modern climate projections focus on the next few decades or so, noted Thomas Haine , an expert on ocean circulation at Johns Hopkins University. And within 50 years or so, both the uncorrected and corrected models in the new study produce similar results. It is only after that, under extreme warming, that the current shifts. Liu also cautioned that certain aspects of the experiment can’t exactly be considered realistic – for instance, instantaneously doubling the atmospheric carbon dioxide concentration. Current climate efforts are aimed at keeping us from ever getting to such a point – but even if we did, the process would happen gradually, not overnight. So the model’s outcome might have been different if the researchers had adopted a more realistic scenario. Haine also suggested that the correction in the new study may have actually been a bit too strong, compared to actual observations – in other words, the modeled AMOC is “probably more unstable than the real system,” he said. Rahmstorf also pointed out this issue in his commentary – but he added that the climate model used also did not account for an influx of meltwater from Greenland under future climate change, an event that recent research suggests could substantially speed the AMOC’s weakening.